This Power Adapter comes with 12 tips to fit almost all Notebooks and LCDs models. 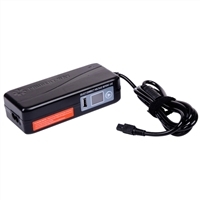 Maximum Power 120W; Adjustable output voltage; Adjustable 12-24V output design fits specific Notebook models and LCD needs; 12 tips included to fit almost all Notebooks and LCDs models. (Dell tip included) Worldwide range AC input from 100-240v to meet worldwide power conversion capability; High Efficiency, High efficiency design (efficiency >80%) and low power Consumption; Full power protection, Overload and short circuit protection; Extra USB port built in.